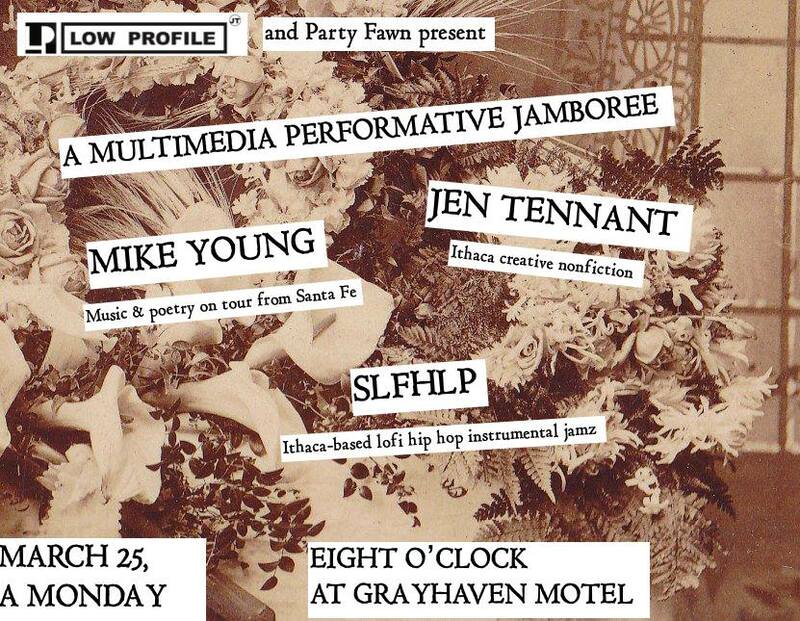 Low Profile Events and Party Fawn Reading Series (ok really just Marty) and also Joe Hall are collaborating to BRING YOU… a trio of rad folks at the Grayhaven!!! One touring + two super locals! Mike Young is the author of three books: 2014’s Sprezzatura (poetry), 2010’s Look! Look! Feathers (stories), and 2010’s We Are All Good If They Try Hard Enough, which was selected by readers of The Believer as one of the Top 20 Poetry Books of 2010. Since 2007, he’s run Magic Helicopter Press, which puts out chapbooks and full length books and interactive art. MHP stuff has received nice nods from the New York Times, Nylon, The Rumpus, American Book Review, and others. He lives in Santa Fe, NM, where he makes music: with a band (http://clementinewasright.bandcamp.com/) and by himself (http://blackcake.org/album/imagine-a-fire-you-can-wear-as-a-coat-by-anthony-graytone). Jen Tennant is an associate professor of Economics at Ithaca College, focusing on disability policy and health economics. Her creative nonfiction has appeared in Pleiades, The Smart Set, and A VELVET GIANT. This year, she is interim co-director of the New Voices Literary Festival at Ithaca College. SLFHLP is the solo project of Nick Scollard, drummer of Joyous Shrub 666 and Wildflwr fame; lo-fi hip hop beats with wistful stoned-and-wading-in-a-gorge-in-the-summer vibes.